In September 2017, Jabree Ltd was engaged by Crown Law Queensland on behalf of the Queensland Department of Education and Training (DET) to undertake an Aboriginal Cultural Heritage Assessment for an expansion area within and around the Pimpama State School. The results of the surface and sub-surface investigations conducted on the 26th of September identified the western section of the project area as an area of cultural heritage significance, with potential for in-situ archaeological deposits. Three stone artefacts were discovered from four test excavations undertaken over a thirty (30) m2 area. 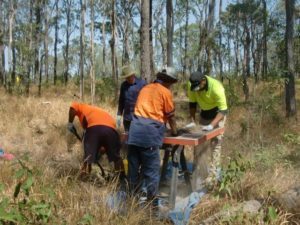 In accordance with the Aboriginal Cultural Heritage Act 2003, and its Duty of Care Guidelines, Jabree’s assessment highlighted that development of this western section would likely cause harm to Aboriginal Cultural Heritage. Repatriating all cultural materials recovered during the assessment process, to a suitable site within the project area in the future.